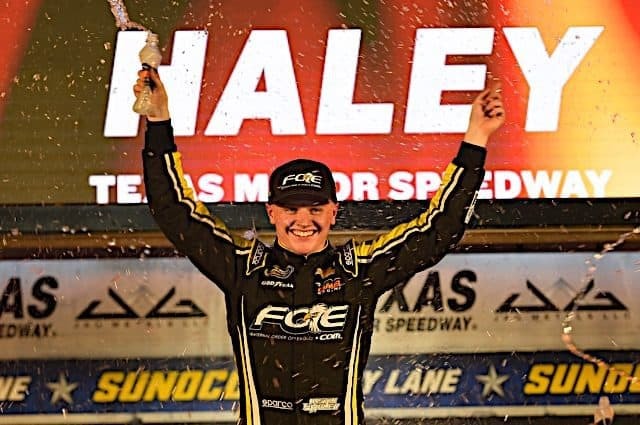 In a Nutshell: Justin Haley took advantage of Todd Gilliland‘s empty fuel tank to score his third victory of the season Friday night at Texas Motor Speedway. The driver of the No. 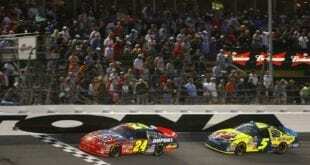 24 Chevrolet beat Ben Rhodes to the checkered flag in the JAG Metals 350. Brett Moffitt, Gilliland and Austin Hill rounded out the top five. Speechless. This is an opportunity of a lifetime to run for a Championship with @GMSRacingLLC. My 24 guys are unbelievable, we stick with eachother no matter what. They gave me a hotrod tonight & I’m so thankful to be apart of the team We’ve got momentum, the Darkhorse is coming. Harrison Burton, who made his sixth start this season, finished sixth, followed by Jesse Little. 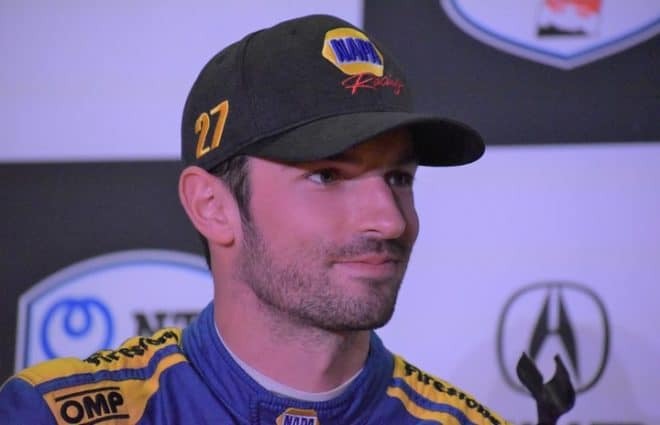 Stewart Friesen, Matt Crafton and Noah Gragson rounded out the top 10.
Who Should Have Won: Friesen led 12 laps and appeared poised to score that elusive first career win, but a speeding penalty sealed the deal and gave Gilliland the lead and clean air. Then, the driver of the No. 4 Toyota, who led a race-high 60 laps, simply needed to hit his marks and cruise to the checkered flag. But it was Haley, who led 33 laps on the night, that was there to capitalize when Gilliland ran out of fuel and coasted to a fourth-place finish. 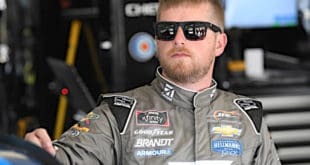 Johnny Sauter, who locked himself into the Championship 4 following a victory at Martinsville Speedway last weekend, started on the pole after leading the opening practice session at Texas Motor Speedway. 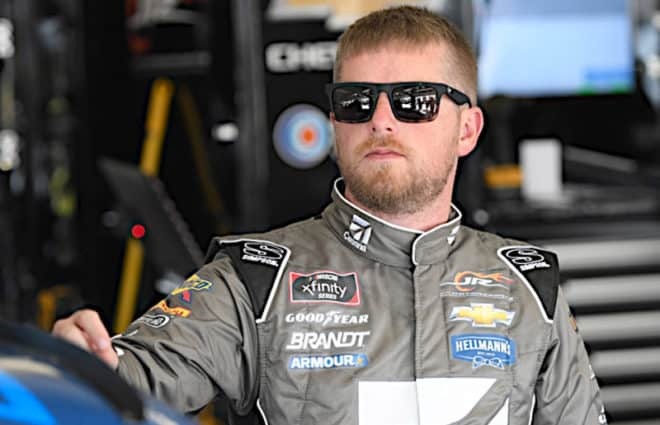 He led just the first lap before giving up the top spot, a position he never managed to regain, despite a dominant run at the mile-and-a-half oval in June. On the restart after the first caution, Sauter dropped back from inside the top five to outside the top 20 before taking his truck to pit road. The flat right-rear tire cost the 2016 champion a lap, which he quickly regained with a free pass when the second yellow flew. Just a handful of laps after the free pass, Sauter was tagged by Bayley Currey as the pair attempted to avoid a spinning Codie Rohrbaugh. Shortly after stage two began, Sauter and Gragson got together when Cory Roper and Tyler Young tangled. The left side damage on the No. 21 Chevrolet led to an extended stop on pit road but Sauter was able to continue. Despite facing multiple issues on the day, Sauter still managed to finish 11th as the last driver on the lead lap. 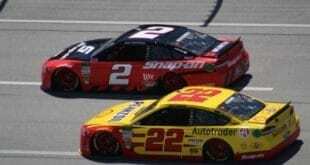 As the laps wound down on Friday night’s race, Gilliland held a more than five-second lead over the field and appeared to be cruising to the win, but a late-race pit stop for just one can of fuel turned out to be the move that doomed the rookie, who saw his first career win slip through his fingers on the white flag lap once again. 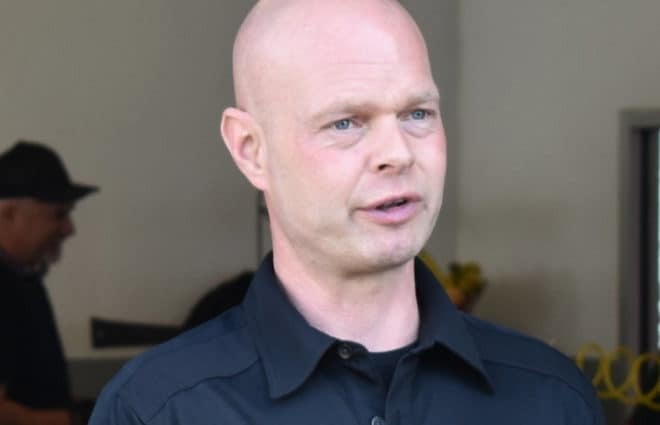 For Gilliland, it wasn’t the first issue he had on Friday. He hit the wall in qualifying and was forced to start at the back of the pack after the team made unapproved adjustments. “I’m incredibly disappointed, upset with myself and I still feel like we could have been faster if I didn’t wreck in qualifying,” he explained. “There are so many things. We win and lose as a team. I’m super proud to be in that position and to be fighting for wins every now and then, but I feel like we’re right on the verge of being a competitor every week and I feel like once we get to that amount of speed the wins will keep coming easier. With just two races remaining, Gilliland’s chances to find Victory Lane this season are dwindling. DGR-Crosley suffered a tough night at Texas when both of its trucks crashed during the first stage. Bo Lemastus spun on his own to bring out the first yellow just three laps in. The damage proved terminal and he finished a disappointing 32nd. Meanwhile, David Gilliland smacked the wall hard just 14 laps in and took his wounded No. 17 Toyota straight to the garage after bringing out the second caution. He wound up 30th. Both David and Bo have been released from infield care. Stage one and stage two both ended under caution. Justin Haley and Myatt Snider scored their first stage wins under those yellow flags. Texas Motor Speedway announced a new multi-year deal with Vankor as title sponsor for its spring Truck Series races beginning next season. The “independent energy and commodities company headquartered in North Texas” will serve as the title sponsor beginning in March. 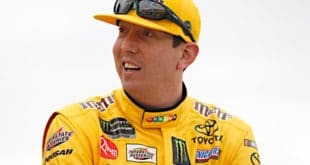 In eight seasons since 2000, a driver who has won at Texas, whether in the June or November race, has gone on to win the championship, including the last four straight in Christopher Bell, Johnny Sauter, Erik Jones and Matt Crafton. Sauter won at the mile-and-a-half oval in June, while teammate Haley took the win Friday night. Both are locked into the Championship 4 and have a shot at winning the title. With 35 trucks on the entry list for Texas, three drivers were sent home. Jennifer Jo Cobb‘s team withdrew the No. 0, set to be piloted by Camden Murphy, before the weekend began. Meanwhile, Josh Reaume and Reid Wilson failed to qualify. The full field marks 21 straight races this season the Truck Series hasn’t run a short field this season. Just two races remain to keep that streak alive and mark full fields for every race on the schedule for the first time since 2005. Points Update: Johnny Sauter and Justin Haley have locked themselves into the Championship 4. 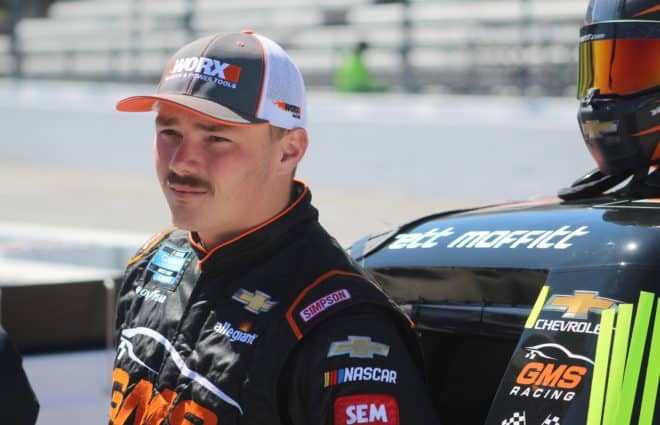 Brett Moffitt currently sits 22 points above the cut line, while Noah Gragson holds an 18-point advantage. Meanwhile, Grant Enfinger and Matt Crafton find themselves on the outside looking in. The two are 18 and 23 points below the cut line, respectively with one race remaining to find their spots in the championship battle. Up Next: The Camping World Truck Series heads west next Friday night for the second-to-last race of the season at ISM Raceway in Phoenix. Coverage for the Lucas Oil 150 begins at 8:30 p.m. ET on FOX Sports 1; the race can also be heard on your local MRN affiliate or SiriusXM NASCAR Channel 90.